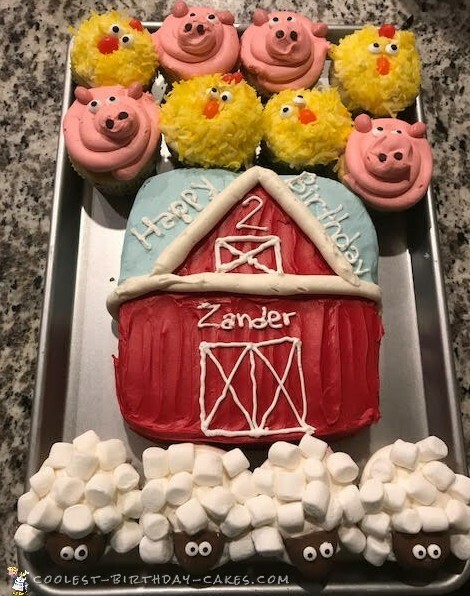 This was for my 2 year old’s farm themed birthday party. I reserved a party house at a local farm. Then, I purchased farm Birthday decorations. I also searched Pinterest for ideas. I forgot to buy candy but was able to raid my kids Easter basket. Who knew that a lamb face was easily a half of a Reese’s Egg! I used the 2A tip on the cupcakes and the roof. For the lettering, I used a number 3 tip. The eyes are candy eyes on half a Reese’s egg. 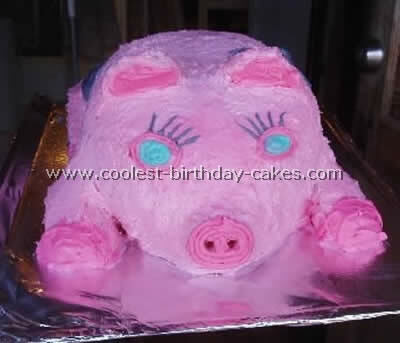 I used mini chocolate chips for the pig snout. For the fluffy chicks, I dyed coconut yellow. I used jelly beans to decorate the pigs and chicks. I feel like I nailed my 2 year old’s birthday party with this cupcake and cake combo.